for example, this is not an egg, nor a nest. life likes to surprise us, play games with us, tease us a little. or maybe it’s not life that does that, but our own minds. you discover something completely different. something that looks like one thing, but is really another. and sometimes it is all just a big joke. Hmmm….what a fun question, aguja. Is it a mushroom or toadstool or popping out of the earth? I am so sorry I used the wrong name….I forgot where I was in the blogosphere! !! this is wonderful, though i have no idea what the image is. the words, however, i know as truth. 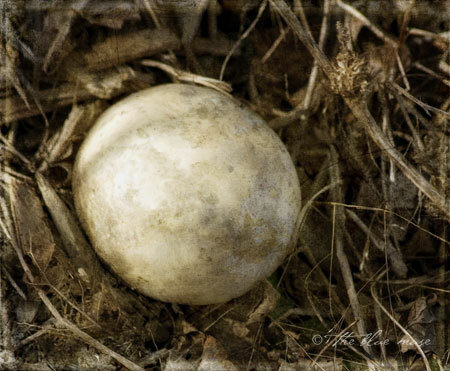 Great thoughts on what is & isn’t:) And I really thought that was an egg…is it a mushroom?? A piece of hail that hit the ground during a thunderstorm? I have no idea what this is, now that I know it’s not a nest and an egg, but I do know, I loved this post. Truly something to think about. Thank you! Well, it could be a mushroom, but I really think it’s a tiny baby moon, fallen from the sky, that landed safely among the leaves and twigs. Well you sure have me fooled! I like the idea of a baby moon, and a mushroom sure seems probable, but I’ll guess something else..
How about one of those insect cases that you might find growing on a loose-barked tree? A stone on the forest floor. It looks like a mushroom to me too . . .
Perhaps a white eggplant or squash? A fossil of some kind? At first sight, a marble. Imagining, I saw the seed and birth of hope, earth in our hands. In the shadows, a flower blossoming (towards the bottom right of the seed — can you see it? A tulip blooming). Thanks for another weekend gem. a long forgotten, decayed ball of some sort. A white, Japanese eggplant, or a lemon cucumber?